Alison Blickle, ''Sand of the Philosopher,'' 2013, oil on canvas, 60 x 36''. 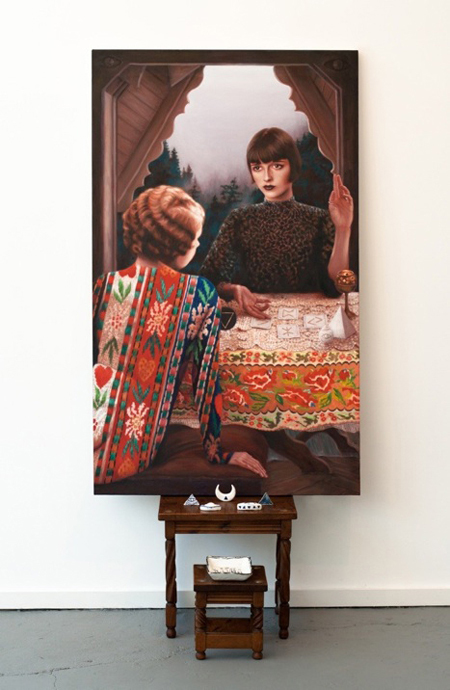 That Alison Blickle’s new paintings, titled "History of Magic Part 1 … The Hermitage," with their scantily clad young things, are surely subject to feminist critique is inevitable, despite the perfunctory narrative subtext that surrounds them. The title of the show comes from Eliphas Levi’s occultist book of the late 19th century, which combines the mystical lore of various cultures with Christian symbolism. The great upsurge in mysticism at the time, paralleling our own New Age, took, in art, the forms of Symbolism and abstraction. Younger female critics have judged these semi-nudes as expressions of female empowerment. But older gazers like myself, perhaps having been ideologically shaped decades ago, can’t accept that, however conflicted between attraction and skepticism the artist says she is. Blickle’s previous style, less naturalistic and sensuous than it is here, evolved neutrally from cartooning and expressionism. Those seemed to me more amenable to depicting her declared search for psychic balance and oneness. Others may be more open than I to to validate this current mix of eroticism with retro fashion.